The pawpaw is a delicious fruit indigenous to this country and was eaten by native Americans and early settlers. The fruit has a distinctive creamy custard texture and a sweet mango banana like flavor. It is excellent when eaten fresh, and delicious in puddings, cookies, pies, ice cream and breads. Pawpaw fruit is reported to be higher in proteins and carbohydrates than apples, peaches and grapes, and it contains high levels of amino acids, vitamins A and C, and many minerals. Pawpaw ( Asimina triloba ) is the only temperate climate member of the tropical family Annonaceae, which includes the cherimoya, a cultivated fruit popular in the tropics. In the wild it grows from southern Michigan to Georgia and from the Atlantic coast to Kansas. It is generally found in the understory of wooded areas, especially in rich moist bottomlands and along streams. The tree will grow in well drained upland wooded areas, although in these locations the fruit may be less abundant and somewhat smaller. The pawpaw is deciduous and reaches heights of 20 to 30 feet, occasionally 40 feet. If space and light allows, it will develop into a handsome cone-shaped specimen. The tree tends to send up off-shoots from stolons every few feet, a tendency which diminishes if confined to one trunk. The tree’s large, drooping, elliptical leaves give it a tropical appearance. The leaves measure up to 12 inches long and 3 to 4 inches wide. 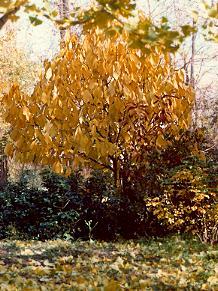 In the autumn they turn a golden yellow. A pawpaw seedling should begin blooming in six to eight years. The flowers are dark maroon in color and up to 1 1/2 inches across, blooming occurs on previous year’s wood. They have six leathery petals, three on the outside spreading into a rounded triangle and three smaller petals nestled on the inside. The flowers exhibit a drooping or downward posture. Tiny clusters of fruit appear after pollination. The clusters, typically have two to six green skinned fruits, point outward in a manner similar to bananas. In northern Illinois the fruit will mature from late September through mid October. The pawpaw’s intense tropical flavor, sweetness, and aroma will fully develop if left on the tree until it is ready to drop. This is the time to pick pawpaws for favor quality; however the fully ripened fruit has a shelf life of only a few days and it is easily damaged. The fruit can be successfully stored in refrigeration for up to three weeks. The fruit ranges from a few ounces to as much as a pound; typically, the fruit will be five to ten ounces. 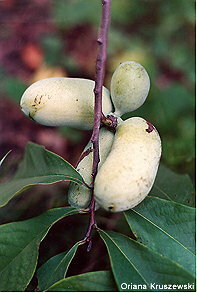 Pawpaws, generally, are three to five inches long with a caramel yellow pulp containing two rows of dark brown lima bean-like seeds that take up a large volume. The seeds are not difficult to remove. Why has this hardy and delicious native fruit that thrives with little or no care, highly resistant to insects and diseases, been largely overlooked? The major drawbacks are: the fruit is highly perishable, thus commercial production and handling methods have never been developed. Successful transplanting of a tree or root sucker is difficult because of the taproot, therefore, the pawpaw is grown by very few home orchardists. If you are interested in edible landscaping that is attractive in appearance, try a pawpaw. To get a pawpaw going consider buying seedlings or grafted cultivars from nurseries. Another simple way to start a tree is to plant seeds outdoors in the fall. Collect seeds from a tree that has tasty and abundant fruit. Be sure to keep the seeds moist until planting. Plant the seeds in a spot that is moist and partially sunny. A shallow planting is best. Also good results can be obtained by simply scattering seeds on the ground and then covering them with two or three inches of rotted mulch or leaves. Shoots will not appear until the following summer. Sometimes the seeds may lie dormant a year and not germinate until the second spring. If the selected area is sunny, the seedling will need shade for a couple of years. Full sunlight is deadly to seedlings. This problem can be overcome by putting a barrel ( approx. 30” long ), open on both ends, around the seedling. The barrel may be removed when the seedling grows to the top of the barrel. You should have two or more varieties to insure fruit set. If it should become necessary to transplant, the best time is in the spring when the tree is only one or two years old. Grafting can be utilized to propagate cultivars exhibiting desirable fruiting characteristics or as a means to avoid the difficulties of transplanting. Once a seedling trunk has grown to about the thickness of a pencil it is suitable for grafting scion wood from a tree one wishes to reproduce. Scion wood should be from last year’s wood and contain at least two good leaf buds. The leaf buds have a flattened profile and taper to a point, whereas blossom buds are roundish, larger and are a darker brown. A good time to graft is when the buds on the understock are showing green. If by chance a seedling, or seedlings, upon reaching fruiting age produces fruit not of your liking simply graft on scion wood from a tree producing fruit of desirable characteristics. Peterson Pawpaws, PO Box 1011, Harpers Ferry, WV 25425, (304)535-3125. Pawpaw expert and founder of The PawPaw Foundation, Neal Peterson owns this nursery. MidFEx members love the quality of his nursery stock; a highly recommended source.